Over the last several years, a tool I’ve shared with all of my executive clients has been to measure their response to almost any situation through the use of a natural process of pause, reflect, then choose (PRC). In the course of a recent coaching engagement, the executive asked for clarification of the reflect stage of the PRC process. This question led me to realize that there was more involved than simply to reflect, but to reflect on an appropriate response consistent with the individual, the situation, and the executive’s desired outcome. While considering the numerous examples of how to reflect on these three aspects (of the process), I realized that I was actually indicating a more complex process. Specifically, the act of reflecting takes the executive out of the habitual response mode thereby enabling him/her to take into consideration whether to acknowledge, inform, direct, recover, or to repair. As the executive instantly assesses an individual and the situation that surrounds a conversation, the typical response is quick and likely to replicate similar circumstances from numerous other experiences. The desired action is rarely a conscious decision as it tends to be consistent with the executive’s prior successful decisions. When I am brought in to support the executive, it is often because his/her style has become problematic. In short, the habitualized response is no longer effective. As I considered this executive’s request for clarification, I realized that the process of reflection addressed the dynamic of executive engagement. The reflective pause creates an immediate opportunity to decide whether to acknowledge, inform, direct, recover or repair depending on the situation. In other words, much of PRC is related to the executive’s engagement style. A recent article by Cuddy, Kohut, and Neflinger indicated that to effectively influence, an executive must first connect with others before moving into areas of expertise and competency. (Connect, then Lead, HBR., July-August, 2013). To fully appreciate this dynamic, a correlation between the degree of warmth (personal engagement) and the executive competency was created. It revealed that there are four reactions to the executive style of engagement (or presence) based on this dynamic that include— active engagement, passive support, active harm, or passive harm. Active engagement suggests that the executive pauses to acknowledge and “see” the individual before moving into the active conversation of the situation at hand. Passive support suggests moving quickly into engaging the situation without acknowledging the individual beyond a quick greeting. Passive harm suggests that the executive does not engage the situation with competency nor the individual with any acknowledgment as a person. Active harm suggests moving directly into strong problem solving to the exception of the person and could include outright condemnation of the individual. An underlying aspect of connection with the executive is the instantaneous assessment of the situation by the employee. He/she quickly determines “can you be trusted to hear and understand him/her” or if it is an “us versus them” situation. It is common for clients to have less understanding of this process resulting in the “us versus them” mentality when in decision-making mode. For example, as noted in the research article mentioned above, connecting is a critical aspect of the overall perception of all peers and direct reports. PRC creates the opportunity to first acknowledge the other person, and then to determine if this is an opportunity to inform or provide direction. In the event that the individual has brought a startling situation to the executive’s attention, the pause can be used to recover from the shock and to proceed to gaining a better understanding. If the conversation involves addressing prior confrontations that resulted in poor relations, the executive can move towards the repair process. As a self awareness and self monitoring tool, PRC has proven to be quite effective. As coaches, we utilize PRC all the time and tend to model it for our clients. Doing so requires a desire to witness how the clients engage others and to slow down and shift from a habitualized, highly efficient mode to a conscious, more effective mode. This distinction is critical for the client to appreciate and integrate. Their habitualized processes are well honed decision-making skills that have likely resulted in their success. Nonetheless, these same skills are often what is causing the dissension with direct reports, peers, and likely the board of directors; ergo the less effective results that led to a coach being hired. One of my clients struggled with PRC for an extended period of time. After many attempts, we took the time to examine how the razor sharp decision-making style served and dis-served him. He liked the adrenal sensation of fast-paced, important decision-making. It provided a sense of significance to his day. As he examined the impact of some of his decisions, we reviewed how his decision-making style was impacting the individuals, situations, and the organization. Based on the feedback provided, it was revealed that his approach often felt like a tidal wave that crushed everything in its wake. Not only was the style washing over the person involved, it often left no room to clarify that the decision had no relevance to the actual problem/situation. This tended to lead to misdirection of action or resources or was a means to bypass the decision as nothing was done until another opportunity arose to get the real issue. Though difficult for him to swallow, the client agreed to use PRC by responding and asking the simple question, “can you phrase that differently—or can you say more— to insure I understand the issue?” Another response was for him to paraphrase what he understood then pause to ask if what he said was that correct. Within a week, the impact was noticed by all. A sense of being heard and understood began to permeate the organization. In addition, the executive noticed that people were beginning to engage him differently—more openly and forthcoming with information. He realized that his style of engagement had preempted open conversations. Most importantly, a tension seemed to lift in most meetings. Instead of a sense of forbearance, decision-making became more consensual and dialogic. Employees felt like better decisions were being made by the team instead of being-force fed by the leader. In this case, we were able to further develop the client’s engagement style by examining empathy and the need for affiliation. Empathy is implicit to PRC as it requires a sense of witnessing oneself and assessing how to affiliate with the individual and situation. Often a lack of empathy in the client is due to a lack of awareness that affiliation in the form of a sense of belonging is critical to all organizations. If there is no sense of affiliation to the executive, the individual and the organization quietly suffers loudly1. Instead of synergy through alignment, there tends to be fragmentation into turf wars and ducking the real issues in the form of silos, stove pipes2, and foxholes3. As the client understands and practices PRC, empathy, the capacity to understand the feelings of others, develops. As a result, individuals and the organization over time tend to relax enough to begin to build deeper understanding that leads to better decisions and more effective implementation. In this specific situation, the executive asked if he should beware of himself and more importantly how can he be effective in a crisis. I answered that the executive that is consciously self-aware tends to be the most effective because he is considering the individual, situation and the desired impact; hence there would be no need to beware of himself. I added that being consciously self-aware does not mean that the executive should neuter himself. A critical aspect of PRC is to know when to take direct action, such as in a crisis. 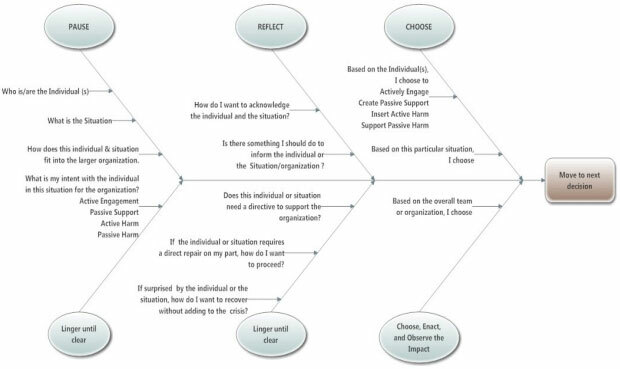 However, the distinguishing aspect of the use of direction is that it should be done after a pause, reflection, and clear choice for what is most effective based on the individual, the situation, and the organization. When PRC is used, the leader is able to connect and therefore appropriately influence the individual, situation, and organization. 1 It is common for the “unsaid”, “unspeakable”, and “undiscussable” to be considered quietly suffering loudly. Many marriages struggle with this issue. It also is found within Abilene Paradoxes. 2 A siloed/stovepipe organization is one where the structure of the organization largely or entirely restricts the flow of information within the organization to up-down through lines of control but inhibits or prevents cross organizational communication. Wikipedia. 3 A foxhole is dug in preparation for an imminent danger. It is designed to get below ground and out of the line of fire.